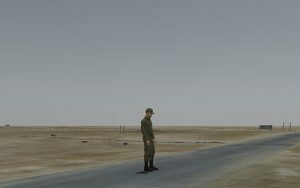 In a computer-generated version of a landscape found in southern Iran, a simulated figure dressed in non-nationalized army fatigues performs a series of gestures, day and night, without ever leaving his post, for a full calendar year during which the simulated sun, moon and stars traverse their actual paths in real time. 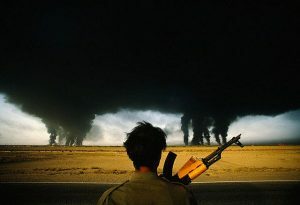 In setting and subject, Infinite Freedom Exercise takes its inspiration from a photograph by French photographer Henri Bureau depicting an Iranian soldier during the first Iran-Iraq war (1980), watching a fire at an oil refinery in Abadan, south-western Iran. The soldier’s vocabulary of gestures was developed in collaboration with choreographer Wayne McGregor, based on the protective stances taken up by soldiers during ‘live fire’ exercises. In its original form as a public installation in Manchester, UK, Infinite Freedom Exercise provocatively opened up a window within the urban fabric onto maneuvers which may seem distant and abstract, yet which are inextricably entangled with Western economies. The infinite tireless grace of the soldier-dancer-actor, with his algorithmically concatenated movements, both evokes and displaces human finitude. The piece introduces a central theme of the Exercise series: the contemporary operation of violence, through the denaturalisation, optimisation, technologisation and traumatisation of the human body as it is integrated into global networks of power and control. In his account of the architecture of the Israeli occupation of Palestine, Eyal Weizman recounts that in the late seventies, Ariel Sharon’s partner in developing the crypto-militarised spatial logic of West Bank settlements was Avraham Wachman, co-inventor of the Eshkol-Wachman Movement Notation, a system for ‘writing dance’ which realises literally the notion of a choreo-graphy. In Weizman’s observation that ‘Sharon’s plan for the colonization of the depth of the West Bank emerged out of the meeting of the architect of dance notation with the architect of manoeuvre-warfare’1—and Wachman’s subsequent protestation that political violence can be unproblematically separated from the spatial and material practices through which it is exercised2—we can already read some of the stakes of Infinite Freedom Exercise. As soon as a graphism provides the function of notation or recording, it produces a virtual space of infinite exercise; writing is continuous with the creation of an inexhaustible virtuality. As Alain Badiou has pointed out,3 in the Turing Machine—Alan Turing’s theoretical prototype of every computing machine extant today—the infinite potential of carrying out any operation whatever is grounded on a real infinite: the availability of limitless length of the tape used to record and read data. Our spontaneous attitude, faced with today’s virtual spaces and their extension into reality, is to collude with this supposition of infinite availability. This seduction of the spaces of procedural graphism, whether literary or electronic, tends to occult their relation to the outside. A realism of the virtual would address, on one hand, an energetics or economics of virtuality, accepting that every virtuality dependent on a source of energy; on the other, the metaphorical transport that makes the abstract space of graphism a real agent in the world it sought to notate (and—as with Wachman—in entirely different worlds). Such a realism would refuse the representationalism that claims that virtual worlds are mere models, whether descriptive or prescriptive: exercises, practices, games, simulations. Now, literary notation becomes obsolete when digital technology can meticulously ‘motion capture’ every significant aspect and movement of a body. In Infinite Freedom Exercise, the ‘performer’, like the ‘landscape’, follows a text assembled, frankenstein-like but seamlessly, out of the data trails of anonymous sources. In an early version of the piece, an oil refinery, burning uncontrolledly, as inexhaustible as the technology that allows its depiction, belches smoke in the distance. The uncanny perdurance of this scene and its tirelessly graceful inhabitant suggests the originary violence of virtuality, in a world where its exercise has become inextricable from reality, where its ‘infinite freedom’ has become political model and casus belli. A. Badiou, ‘Subversion Infinitesimale’, Cahiers pour l’analyse, 1968.